High tech 'smart' pyjamas that monitor heartbeat, breathing and posture could soon be available, according to scientists. The cotton nightwear is equipped with sensors that can detect the sleep quality of the wearer but will cost between £75 and £150 ($100 to $200). 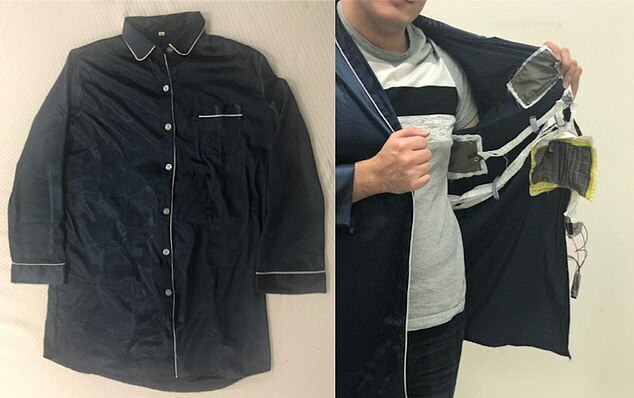 Five self-powered sensors sewn into the shirt's lining will provide continuous monitoring of breathing patterns and the amount of REM sleep the person gets. REM sleep occurs at intervals during the night and is characterised by rapid eye movements, dreaming and bodily movement. Four of the sensors measure pressure, or a body pressed against a bed. The fifth, is positioned over the chest and senses rapid pressure changes, which provides information about heart rate and breathing. The sensors are connected by wires made from thread thinly coated in silver so they are completely undetectable for the wearer. Signals collected from the five patches are sent to a tiny circuit board that looks and functions like an ordinary button. The button has a built-in Bluetooth transmitter that sends the data wirelessly to a computer for analysis. Still in its early stages, the scientists, from the University of Massachusetts, are still in the process of ensuring the sensors are accurate for a variety of body sizes. Getting enough quality sleep can help protect against stress, infections and multiple diseases, such as heart and kidney disease, high blood pressure and diabetes. Previous research has found quality sleep increases mental acuity and sharpens decision-making skills but not enough people get it. 'Smart apparel with embedded self-powered sensors can revolutionise human behaviour monitoring by leveraging everyday clothing as the sensing substrate, said associate professor Dr Trisha Andrew at the University of Massachusetts. Although some manufacturers of smart mattresses claim the products can sense movement and infer sleep posture, they do not provide detailed information to the sleeper and are not portable for travel.